When it comes to going green, recycling in the workplace is an easy place to start. From altering your office lighting to implementing a sustainable waste management solution, there are many ways to become more environmentally friendly. However, despite this, research shows that 85% of waste going to landfill in NZ is from business, this should not be surprising when an alarming 80% of businesses still have no workplace recycling policy in place and make no effort to separate their non-recyclable from recyclable and food waste. Sending a huge amount of company waste to the landfill each year is not only harmful to our environment but can be very costly too. That being the case, learning how to reduce business waste and implementing new recycling policies is definitely a worthwhile project – not only for the environment but for your business too. So how much waste does the typical business produce? From 500 disposable cups to 10,000 sheets of paper, the typical office worker produces quite a substantial amount of waste each year. According to the Environmental Protection Agency, the average person will create around 2kg of waste each day. In other words, an office of around 100 workers will produce an average of 20 waste bags per week – that fills over four 1,100L waste bin each week. First, it’s important to look at ways to ‘reduce’ the waste we produce. By implementing changes at this stage, you may be quite surprised at how many single-use coffee cups and water bottles are thrown away each week. This can easily be fixed by encouraging staff to think about using reusable coffee cups and water bottles – just this alone can substantially reduce business waste. Also, it’s a great idea to reduce the number of personal bins and provide mini recycling centres for departments rather than a bin under each desk. Think about it: a considerable amount of our time is spent in the work environment so it’s just as important that we focus on reducing waste in the workplace as it is at home. After looking at possible ways to reduce business waste, the next step is to start recycling as many waste materials as possible. To do this, you need to have designated places to recycle. These areas need to be clearly labelled and well communicated to each staff member because education plays a vital role in successful implementation. Having separate bins for each waste stream is also really important. Why? Because it ensures that rubbish streams can be recycled easily without becoming contaminated with the wrong items. Did you know: if your dry recyclable materials are contaminated with food waste they’re immediately destined for landfill instead? 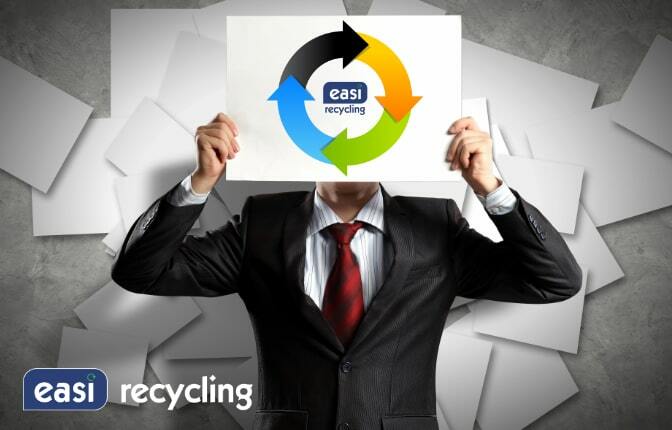 Find out more about what happens to your recycling here. Once your waste is separated by source, it will then give you a better indication of the volumes of your waste streams. The average office will produce, paper, food, water bottles and coffee cups. A typical canteen will produce, food, plastic water bottles, glass and plastic packaging. The key is not to over complicate what is sorted. Many companies choose two or three segregations i.e. 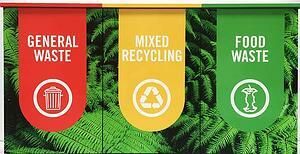 general waste (red) mixed recycling (yellow) then paper, glass or food. If you find you’re producing an exceptionally high waste stream, it’s a good idea to speak with your waste collection company and ask if these can be collected separately – possibly for a reduced rate. Here’s a guide to what you can and can’t recycle. 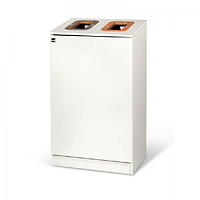 When it comes to a simple waste management solution for your business, our newly launched Bin Multi is a great choice. 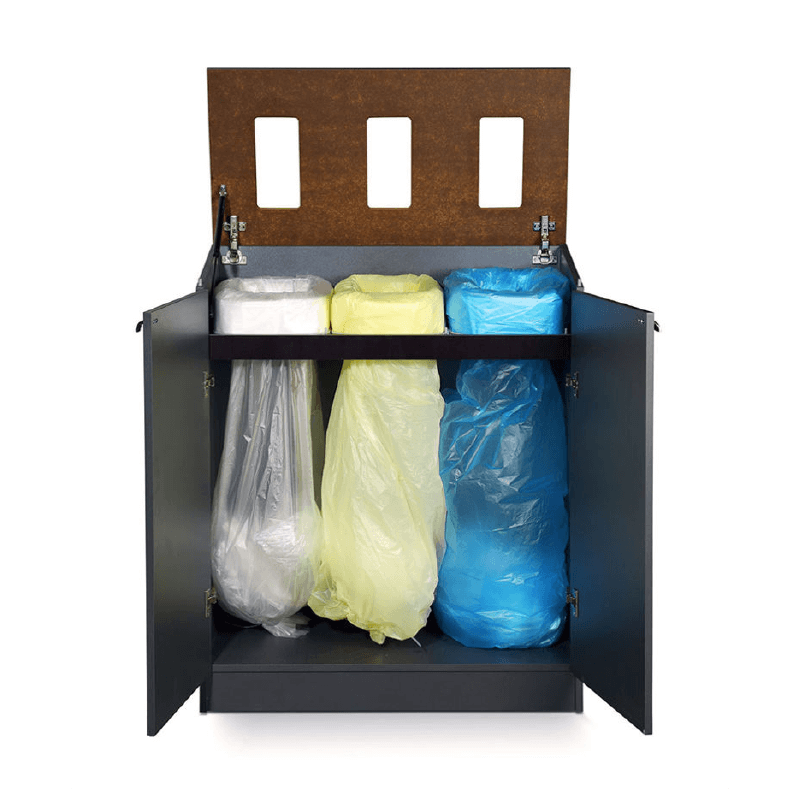 Our bins simplify sorting business waste in a neat and environmentally safe manner – making them ideal for areas such as canteens, offices, corridors, front of store and conference rooms. Each piece of furniture is nicely finished with a clear label on the top that has information about what should be thrown into each opening. Alternatively, bespoke graphics can be added to make your waste bins fun, practical and informative. Who said recycling has to be boring? What’s more, our Bin Multi does not take up any more space than a large waste bin, yet our unique bagging system means that 100% of the bag is used – compared to only 50% or less in traditional systems. If you’re a company that empties your bin every day – regardless of whether it’s overflowing or nearly empty – then your plastic bag usage could reduce by 70%. Read more about our bagging system here. To ensure that each waste stream is easily identifiable after leaving the cabinet, our Longopac cassettes come in 6 different colours. Put simply, our Bin Multi helps your business invest in a much more efficient waste management solution that’s more cost-effective, hygienic and environmentally friendly. .
Want to learn more about our Multi Bin Waste Cabinet? Download the product PDF here. Learning how to reduce business waste and implement an effective waste management solution for recycling in the workplace has benefits for both your company and the environment. Need help getting started? Click here to complete our waste audit form or call our friendly team now on 0800 342 3177 to find out more. Let us help lead the way in managing your workplace waste. 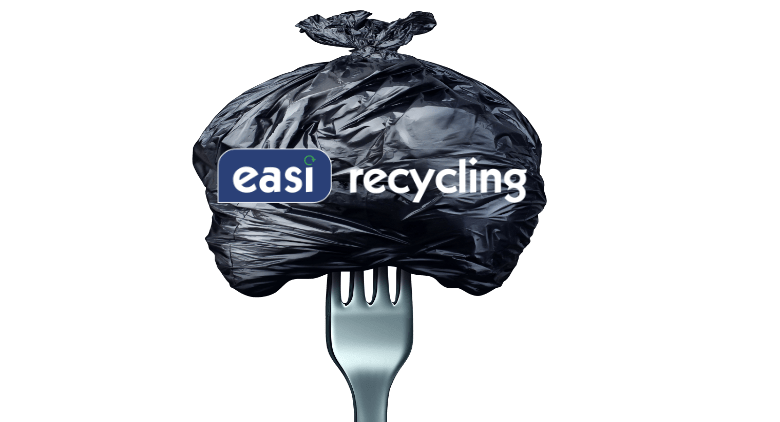 Copyright © 2018 Easi Recycling NZ.